"...early in September, the potatoes were 'blackened and spoiled; they smell at a distance the same as after a frosty night late in October." Four years later, in 1820, a great quantity of snow fell during the end of the year. This accumulation produced remarkable terrestrial phenomena during the early months the following year; for instance, the 'moving bog'. During May and June, of that year , the rain accumulated upon the surface of the land. Rivers and lakes swelled causing wide spread flooding over the face of the land and the rain continued to pour in torrents during November, December and January the following year. The potato crop soured and rotted in the ground; and although a sufficiency was obtained in the dry and upland districts to support human life for some months, the potato reserves were exhausted early in the ensuing spring. Fortunately, these effects were not general throughout the kingdom, but occupied a district which might be defined by a line drawn from the the counties of Sligo and Leitrim, to the counties of Cork and Waterford including the whole western seaboard of Sligo, Mayo, Galway, Clare, Limerick, Kerry, and Cork; all of which were exposed to the full force of the Atlantic, the influence of which, though mild, is a constant source of moisture. 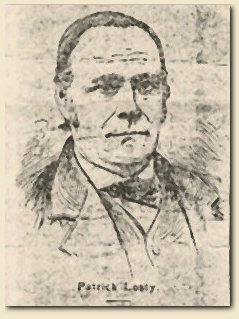 It was during these years that Matthew J. Losty and Mary Jane Losty welcomed the birth of their son John. In 1825, although the seasons were mild, the preceding years had saturated the earth so much there was a partial failure of crops resulting in the rise of the price of potatoes. It was during this year that Matthew J. Losty and his wife Mary J. (unknown) welcomed the birth of their son Patrick Losty. Their elder son John Losty was born prior to Patrick's birth but the exact year is unknown. The names of Matthew & Mary's other children are unknown at this time. During the month of August 1829, Patrick and John were young boys, Patick was only four. The potato crops were beaten down that year by the heavy rains and severe storms. All the potatoes in the low grounds were covered in water, and remained under water for many weeks resulting in the lose of a great quantity of the potatoes. "Violent storms and heavy rains brought upon another failure of the potato in 1830, with its usual accompaniment of famine and pestilence: but was principally confined to the coasts of Mayo, Galway, and Donegal on the west coast. This blight was common to parts of America and to Germany, where it continued for two years. Then in the spring season of 1832, and for several seasons following in succession, an unmistakable epidemic attacked the potato throughout Ireland, and also extended to other parts of Europe and to America. The potato disease presented not only the appearance of the curl, but likewise attacked the tubers in the pits. The failure was chiefly observed in the early-planted potatoes, but having been discovered in spring; was, to a certain extent, remedied. In 1836, which had been wet, and July and August unusually so; the price of food rose to an almost unparalleled height. 1839 was distinguished by an amount of moisture unparalleled to that of modern observations. 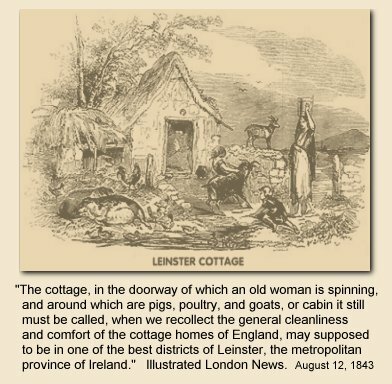 Part of 1840 was likewise characterized by excessive moisture, although there was less rain in 1840 than in the previous year, it came down at an unpropitious period resulting in the failure of the potato crop in Leinster and Munster two years in a row. Upon both occasions great distress followed. As mentioned earlier, Kildare County is located in Leinster. The potato disease prevailed to such a degree in Germany during this time as to threaten the total extinction of that esculent; and in the following year the crop was extensively affected there with a disease called 'dry gangrene.' That same year in Ireland, excessive rains in August caused a partial destruction of crops that was widespread, especially in the south of Ireland. The year was cold and frosty although not specially characterized for its wetness, the number of days upon which rain fell was very great. As a result, the potato harvest of 1842 was injured by the inundation of the land. By 1843 there were more fatalities to animal life than vegetable life and it is during this year Matthew J. Losty's wife (now widowed) and her son Patrick, now age 18, arrived in the United States.